Rehabilitation/Assist Robots with Social Cognition. The HRI and RI Group aims to develop the fundamental technologies on the above areas and tries to make them useful in many practical applications, not only robotics fields but other industries. As recent applications, our group have developed a socially assistive robotic companion to help some autistic children and have been also developing a life-care robot to monitor and socially assist dementia patients. In all the HRI and robot intelligence areas, the HRI and RI Group can be a direct contact point for the related companies, and offer a lot of technological know-hows and a broad variety of experts as well as the latest technologies required to help them achieve their goals. The group is trying to provide applied R&Ds in almost all HRI and RI sectors for a broad range of robotic industries. 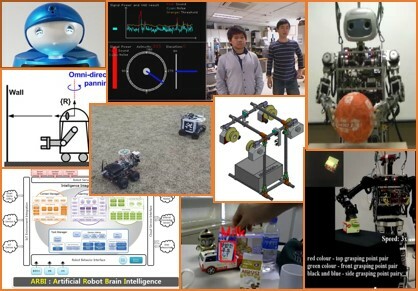 SS Yun, H Kim, JS Choi, Sung-Kee Park, "A robot-assisted behavioral intervention system for children with autism spectrum disorders," Robotics and Automation System, vol. 76, pp.58-67, 2016. Y Chen, Y Ma, DH Kim, Sung-Kee Park,"Region-Based Object Recognition by Color Segmentation Using a Simplified PCNN," IEEE Transactions on Neural Networks and Learning Systems, 26(8), pp.1682-1697, 2015. RK Ala, DH Kim, SY Shin, CH Kim, Sung-Kee Park, "A 3D-grasp synthesis algorithm to grasp unknown objects based on graspable boundary and convex segments," Information Sciences, vol.295, pp.91-106, 2015. S Park, Sung-Kee Park, M Hebert, "Fast and scalable approximate spectral matching for higher order graph matching," IEEE Transactions on Pattern Analysis and Machine Intelligence, 36 (3), pp.479-492, 2014. This page was last modified on 8 May 2018, at 17:56.